Three airports serve Washington. 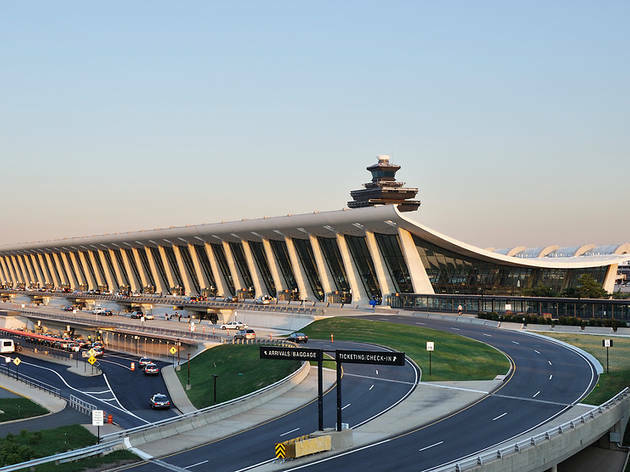 Washington Dulles International Airport, 25 miles out in the suburbs of Virginia, handles the longer flights into the region, including most international flights. Baltimore-Washington International Airport (or BWI) is a lot closer to the first half of its name but easily accessible from Washington by public transport, and is popular for its cheaper fares and more bearable traffic. Ronald Reagan Washington National Airport (most people still use the old name ‘National’) is the closest to DC, located just across the Potomac River from Downtown, and gives a great view of the monuments as you fly in; it’s used mostly for short- and medium-haul flights within the US and Canada. The airports have their own official websites, but for general information, including ground transport, shops and services, hotels and maps, go to www.quickaid.net or www.metwashairports.com. The quickest and cheapest way to downtown DC is by getting the Washington Flyer Bus (1-888 927 4359, www.washfly.com), which operates between Dulles and the West Falls Church Metro stop (20- to 30-minute ride) at the western end of the Orange Line. It costs $10 one way, $18 round trip, and runs at least every half-hour (5.45am-10.15pm Mon-Fri, and between 7.45am and 10.15pm Sat, Sun). 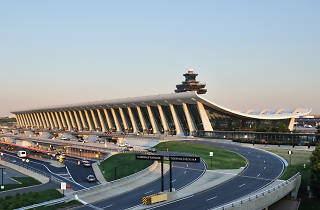 The Washington Flyer Taxi Service (1-703 661 6655) has the sole concession to operate out of Dulles. A ride from Dulles to downtown DC costs about $55-$65 plus tip. All Washington Flyer cabs are metered and take credit cards. Super Shuttle (1-800 258 3826, 1-202 296 6662, www.supershuttle.com) offers door-to-door shared van service between all three airports and anywhere in the area. Price quotes can be obtained online; from Dulles to downtown DC hotels is $28. It’s helpful to know the zip code of your final destination. Getting to Washington from BWI can often be expensive, a hassle, or both. A cheap combination (best if you have little to haul) to downtown DC is the shuttle-train-Metro option. Take the free shuttle bus (marked BWI Rail, 1-410 672 6169) from the BWI terminal to the train station about a mile away, then catch a MARC ($6 one way, www.mtmaryland.com) or Amtrak (from $20, www.amtrak.com) train south 25 minutes to Union Station from where you can get on the Metro. BWI is also served by cabs, private car companies and the Super Shuttle (see above), but beware of the long waits for the latter. You can get complete BWI ground transport information from the booth in Pier C or by calling 1-800 435 9294. A cab from BWI to downtown DC costs about $60 plus tip. National Airport is served by the Metro subway system (Yellow and Blue lines). It’s about a 20-minute ride to Downtown. Going by cab is another option: signs outside each baggage claim area will direct you to the taxi stand. The taxi stand operator will point you to a particular cab depending on whether you’re going to DC, Virginia or Maryland. Virginia-licensed cabs can take you anywhere; DC- and Maryland-licensed cabs can’t serve Virginia. Since Reagan National Airport is in Virginia, only cabs registered there will take you to the Downtown area. The fare for Maryland, Virginia and DC cabs is determined by meter. All pick-ups from National Airport add a $1.75 surcharge. A cab to downtown Washington costs about $15-$20 plus tip (Virginia Yellow Cabs, 1-703 522 2222). Reagan is also served by Super Shuttle. A train from New York City (Penn Station) to Washington DC takes roughly three hours. Fares vary, costing from around $76 each way for a reserved ticket on the slower Northeast Regional train (journey time around three and a half hours). For a reserved seat on the Acela Express service, which takes only two and a half hours, a one-way ticket is approximately $158-$203. For more information on trains, call Amtrak on 1-800 872 7245 or go to www.amtrak.com. All trains to DC arrive at Union Station, which has its own Metro station. The bus journey from New York takes around five hours, but it’s really cheap—starting as low as about $15 booked in advance and going up from there. Greyhound buses (1-800 231 2222, www.greyhound.com) leave from Union Station, and arrive at the Port Authority Bus Station in New York. Popular value lines include Bolt Bus (1-877 265 8287, www.boltbus.com) and DC2NY (1-888 888 3269, www.dc2ny.com).